In 1968 20th Century Fox sent four astronauts into space and launched one of the most successful science fiction franchises of all time. Planet of the Apes was a hit, both critically and financially. With the success of the first film, sequels were bound to follow, and they did. By 1973 a total of five Ape films had been released. Battle for the Planet of the Apes, the last film, though not as appealing or successful as its predecessors, was still popular in its own right. While 1973 might have seemed like the end of the Ape dynasty, it was actually the beginning of another phenomenon referred to as Ape-Mania. Go Ape! 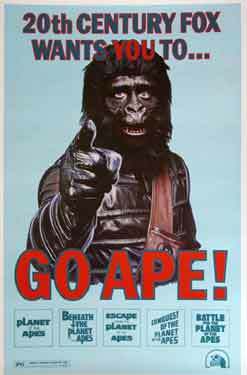 and began showing the first two Ape films on TV and all five Ape films in back to back marathons in movie theatres. As luck would have it, little Kenny Abrams, the son of Mego President Marty Abrams, dragged his father to one of these marathons and in that theatre the idea for the Mego Planet of the Apes line was born. As Marty has recounted in numerous interviews, he sat in the theatre not even knowing what Planet of the Apes was, but saw fathers and sons enjoying the films together and digging the whole ape/future concept. The next day he was on the phone with 20th Century Fox executives outbidding rival AHI and securing the rights to produce figures and playsets based on the Planet of the Apes property. Planet of the Apes was Mego’s first attempt at making toys based on a movie property and they put in that extra effort to get it right. 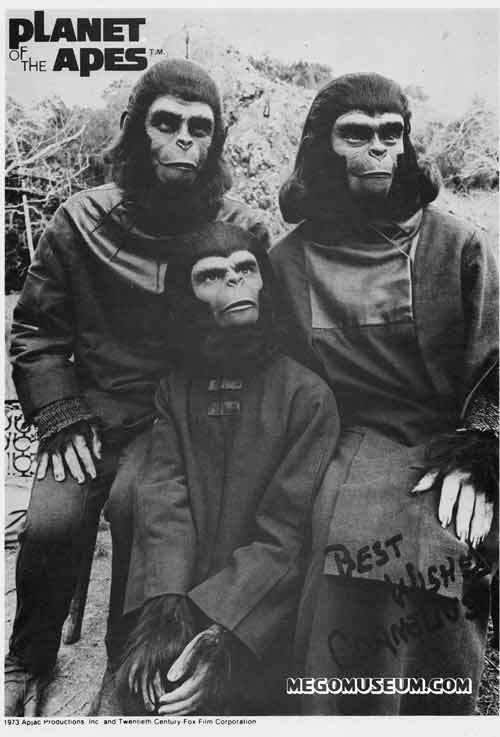 In February of 1974 they unveiled their Planet of the Apes line at Toy Fair to a very positive response from retailers. That years offering consisted of five figures based on characters from the original film; Cornelius, Zira, Dr. Zaius, the Soldier Ape, and the Astronaut along with a Treehouse and Village Playset and a remote control horse, the Action Stallion. In their 1974 Dealer Catalog Mego wrote “The stars of the greatest movie series ever, come alive in these authentically reproduced articulated figures. Each one is 8 inches tall, the favorite size of kids everywhere. All are costumed in exquisitely detailed outfits. Kids everywhere will go ape.” Kids did go ape for the figures when they hit store shelves in the summer of 1974. 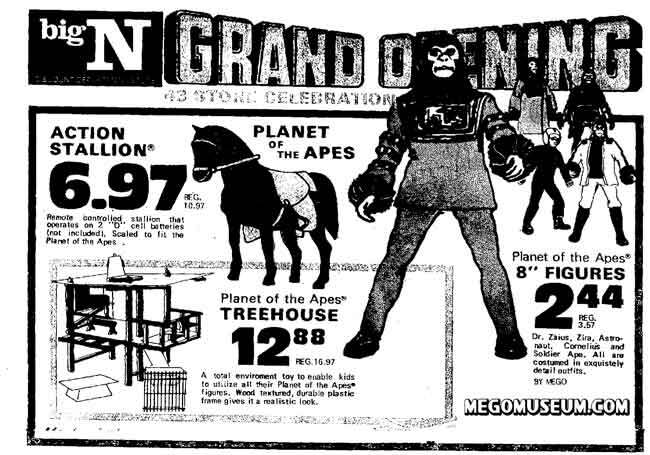 Planet of the Apes was a huge hit for Mego and helped make 1974 Mego’s most successful year to date. 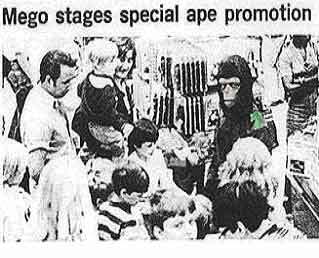 In both 1974 and 1975 Mego Apes made the list of “top ten best selling toys”. Mego was riding the crest of the Ape phenomenon that was sweeping America. and print advertising, in- store character appearances, and even a float in the Macy’s Thanksgiving Day parade. With the cancellation of the TV series however, it seems Mego knew the public’s fascination with the Apes would soon come to an end and never even considered any new Ape toys beyond their 1975 offering. While Ape Mania was slowly dying in America it was spreading to other parts of the world. In the UK the first series of Mego Ape figures were released by Palitoy/Bradgate in 1975, followed by the second series in 1976. In Japan, Bullmark under license from Mego released the first five figures in their own exclusive packaging. 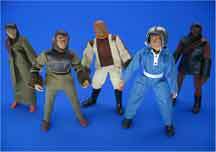 Around 1976, Cipsa, a Mexican toy company, released their own versions of the Mego apes. 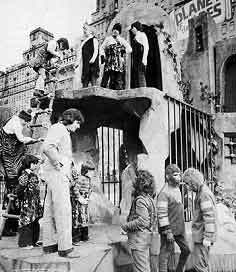 Cornelius,Urko,Ursus, Zaius, and Bill (Virdon) as well as the Treehouse, Jail, Throne, Battering Ram, and an exclusive Horse, catapult, and Wagon were made available to children in Mexico. In Canada, all the US offerings were made available by Parkdale Novelty, as well as an exclusive bilingual boxed treehouse and a Horse, catapult, and Wagon set. In Italy, the first series (minus Zira) was released by Baravelli and in Australia the entire first wave by TolToys. In Spain, the Soldier Ape was released by Posh as part of their Monster series. It is quite possible Mego ape toys made it around the globe in the 70’s and were enjoyed by kids everywhere. 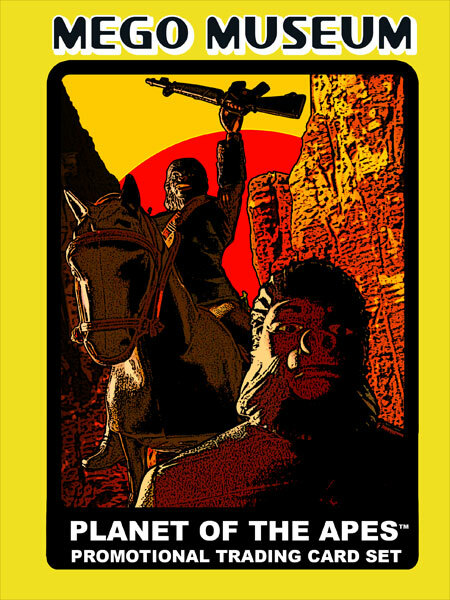 Today, Mego’s Planet of the Apes line is collected by both Mego collectors and Planet of the Apes collectors. The movies and TV shows, now a part of pop culture, seem to transcend generations in its appeal. New fans are springing up every day as the shows are rerun in syndication. If you were a kid growing up in the 70’s, chances are Planet of the Apes was somehow a part of your life. Mego was able to enhance that for millions of children by providing the toys, with which they could use their imagination to create their own unforgettable ape adventures. 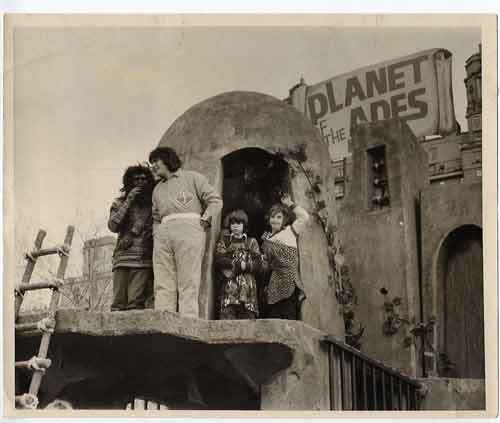 This amazing picture of Neal Kublan and Marty Abrams dressed as a solider Ape and Action Jackson riding the Planet of the Apes Macy’s Day parade Float is courtest of Ken Abrams. Click for a Larger view. 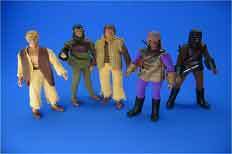 A popular line with Mego collectors, The Planet of the Apes line has many factory reproduced parts. This section will help you identify original parts from reproduction parts. This page features the basic body styles used in the Planet of the Apes line. There are various colors unique to certain characters and the ape characters in the line have hands with sculpted hair on them, but here we’ll address the basic body styles and their reproductions. 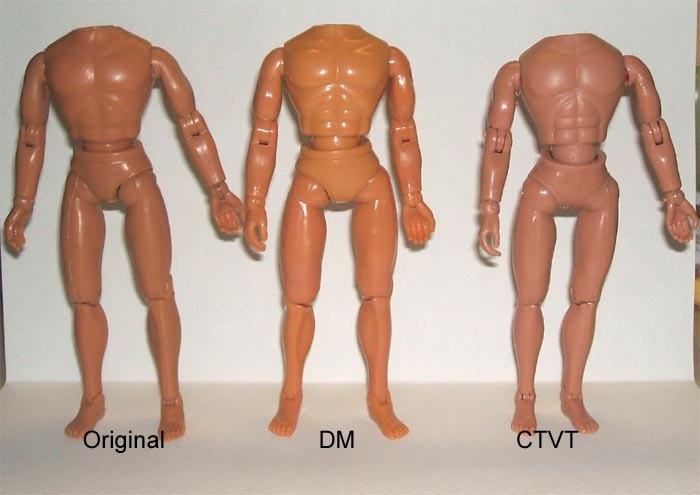 The first version of the mego male body was a metal rivet, less muscled body strung together with elastic. It has not been factory reproduced. CTVT body are the legs that tend to snap together at the knees. It should also be noted that Tim Mee produced the Type 2 body during the Mego era. This is a vintage knockoff that is identical in almost every way to the original body. It’s weight is perhaps a touch lighter, and the Mego copyright info on the back of the body has been blotted out, but otherwise it’s identical. Regarding specific ape bodies. Only EMCE Toys has reproduced the ape body with the hairy ape hands. Again, it is exactly the same as the DM body described above, except with the ape hands and done in a color to match the original Zaius/Cornelius body color, although it is a touch darker. It is marked EMCEToys on the back. Zira is the only female in the Mego Ape universe, and she comes on a light brown body with ape hairy hands. 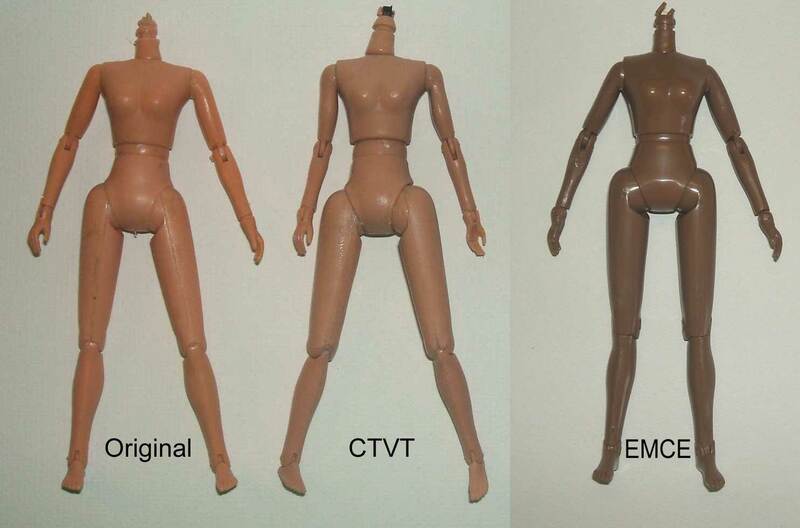 CTVT has reproduced the standard Mego female body though. We picture a caucasian body to show the style of reproduction body available for female characters. The first version (not pictured) had a lot of issues. Cracks, lots of flashing and numorous other issues which are easy to spot. Some CTVT female bodies have a neck hole similar to the male body, instead of the neck stem that Mego used. CTVT eventually redesigned it’s female body to work out most of the issues. It’s close to Mego’s, although the legs still want to twist in an odd way. It is unmarked. Doc Mego and EMCE Toys have also reproduced the female Mego body. This version is very close to the original Mego body. The biggest difference is at the joints. 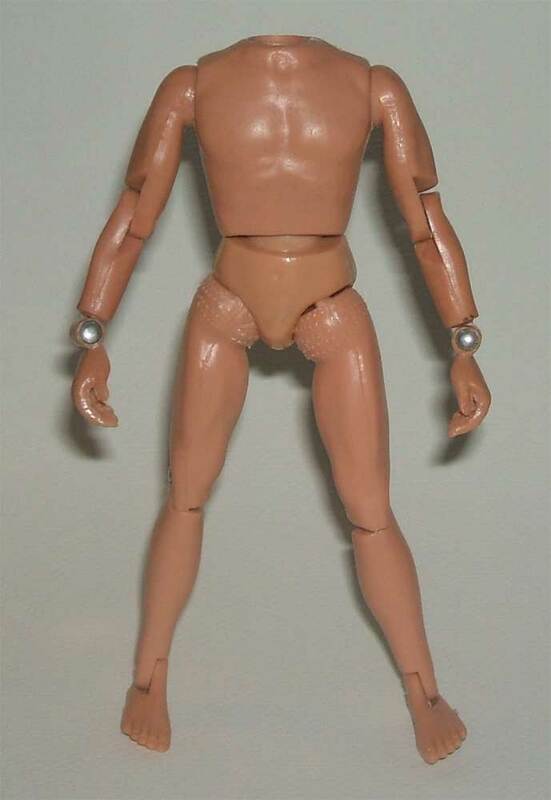 The pin holes on this version are a little larger than on the original body and the knees are re-designed with pin joints making them less prone to loose knees, a common problem with Mego female bodies. The pelvis is slightly different in shape and the legs on snap into the pelvis – bringing the legs together and minimizing the wide hips. The material the female body is made from is very similar to the DM/EMCE male body. The arms and legs are more rubbery than the original, and the torso and pelvis are much harder than an original. This reproduction is stamped with a 2008 Spherewerx / EMCE Toys copyright on the back. They have also produced a female body for Zira with the appropriate color and with the Ape hands. Again, marked the same way and identical in design to the other EMCE Female bodies.